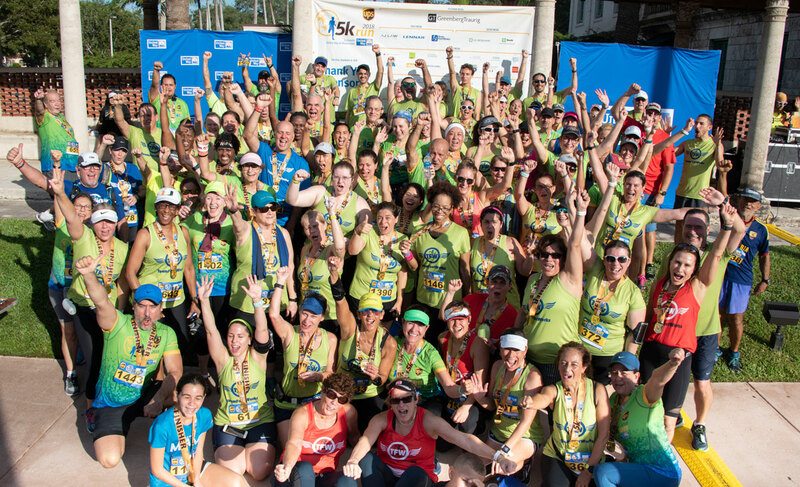 Join the premier half and full marathon training program in South Florida! Our training programs target the everyday person who wants to complete a half or full marathon or improve over a previous performance. With TeamFootWorks, you CAN DO IT!! The secret ingredient is intervals. With interval training, the miles are divided into short manageable segments where you’ll run for just 2 to 5 minutes. After each segment, a 1 minute walk break awaits! This break allows you to recover, catch your breath, hydrate, and regroup while you prepare for the next segment. With interval training, you’re not running 13.1 miles but rather for just the next segment. Our programs consist of 3 training days and one optional day. The Saturday long run or walk is the key to your success. Pace groups are led by 2-3 veteran runners. You will be amazed how quickly the time and miles melt away running or walking with your training team. The energy is contagious and the friendships you develop will be well worth the early wake up calls!! Each of our training programs start with a brief orientation and a 30 minute run/walk. We offer several different pace groups for people of every ability and speed. Our Half Programs even include a group for WALKERS! We aim to finish our Saturday long runs/walks by 8:00am giving you the rest of the day to relish in your accomplishment with your family. Long runs are essential in any endurance training program. The long runs or walks will be done on Saturdays with your training team. You will be amazed how quickly the time and miles melt away running or walking with your training team. The energy is contagious and the friendships you develop will be well worth the early wake up calls!! Most of the long runs will start from the FootWorks Running store in South Miami, 5724 Sunset Dr.
Free curbside parking until 9am. While the long runs and walks develop your ability to go the distance, it is the weekly running and cross-training that will take you to another level of health and fitness. During the week you are responsible for two short runs or walks of no more than 60 minutes. FootWorks South Miami hosts our weekly fun runs on Tuesday and Thursday evenings at 6:30pm to keep your training on schedule. The Spring Half Marathon training program prepares participants for a destination race. In 2017, the team traveled to Central Florida to participate in the Echo Half Marathon. Some members took on the DAYLIGHT TO TWILIGHT CHALLENGE, running the Echo Half in the morning and the South Miami Hospital Twilight 5K in the evening. Unfortunately the Echo Half race is no longer around leaving us to find another event. In the meantime, we’ll setup and complete the TFW Faux Half right here in Miami. Entry to the Faux Half will be included in the training program. The Spring Program begins in February. The Summer Half Training Program trains participants for the October Miami Beach Halloween Half Marathon. 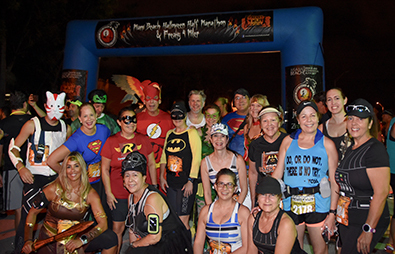 This event marries Halloween, costume themes, and a running event! Each year features a different traditional Halloween character and unique finisher medal. Participants can run in costume and compete in the several categories like fastest superhero, fastest monster, et al. TeamFootWorks is always the best dressed, picking a theme for our costumes like Three Ring Circus, Mad Tea Party, and Super Heroes. The Summer Program begins in July. Our Fall Training program is our largest with over 6oo participants aiming to complete the January Miami Half or Full Marathon. Run your hometown and get a unique Spinning Palm Medal when you cross the finish line. Then come to the TeamFootWorks Hospitality Village at Bayfront Park to enjoy massages, mimosas, omelettes, and more! Participants training for the Miami Full Marathon will start in August while those training for the Miami Half Marathon starts in October. Training with a pace group that is right for your needs! How do I get started with your group? I have run in two marathons, two half marathons and two triathlons but all were back in the 80s and early 90s when I was a paratrooper for the Army. Just register for the desired training program (or the bundle for year round training). You’ll receive an email from the director as the start of the program approaches with the information for Day 1. What are the pace groups for the marathon training? David, we have several pace groups. What’s your speed? The text indicates that the fall half marathon training group begins Oct. 10, but the link says Oct. 3. Which date is correct? Thanks for catching this error on our webpage. It has been changed to the correct Oct. 3 start date of the Fall Half Marathon Training Group. I registered for the full marathon training bundle thinking the start date for training is February 20th. I received an emails stating it is July 9th? The Spring program starts Feb 20. The Summer or Halloween program starts July 9th. Hi, I just registered for the spring marathon training program… Is the first meeting this Saturday @ 7? Will there be a bit of an information session at the beginning or will we just start running? We will meet at FootWorks, 5724 Sunset Drive, on Saturday, February 20th at 7:00am for a quick orientation followed by a 30 minute run/walk. Try to arrive early to find parking, use the restroom, and get situated for the run/walk. There is usually plenty of curbside parking however the South Miami Arts/Crafts Festival is that weekend. Sunset Drive will be closed to vehicles. Are there any Footwork runners training for NYC Marathon that are interested in getting a training group together? I just setup next year’s bundle. You can register now. Hi Eddie, would i be able to join an existing training program or should i wait until the next one starts? I’ve run regularly, but seemed to have plateaued. I’d join the Halloween program to get ready for the Halloween Half. It starts in July. In the meantime, join us at our free fun runs on Tues and Thurs at 6:30pm from the FootWorks Store in South Miami. I will like to run a half marathon but haven’t run in years…is this training for newbies or you should have a base pace to get in? I just wonder if 17 weeks is enough to train for a half marathon if you start from zero…. Hello Naty! Our program begins with a 30 minute run/walk. If you’re ok with that, then you’re ok with Day 1. If you need some prep work before hand, then you can join the Sept 12 Fitness 101 which prepares you to complete a 5K. This class begins with about a 10 minute run/walk. We can pro-rate your registrations fees. Hello Maribel, I just noticed you left a comment. Email me, eddie@teamfootworks.org, and I can help. Do you have the same session in Broward? Our program starts at South Miami Hospital / our store in South Miami. We do not have a Broward location. Do you have similar session in Broward? No, we only offer our program in South Miami. Thanks for checking with us. At what time is the training on Saturdays for the 2016 Half Marathon? Hello Sara! The start time depends on that week’s distance. The longer the run, the earlier the start time. We aim to finish by 8am. Is it possible to still enroll in the marathon program? If so, for how much? Hello JC, it’s too late to join the full marathon program but not too late to join the half marathon program. If i want to start running which program should I pick? HI Ana, if you haven’t run before then I’d suggest Fitness 101. It’s our beginner program that gets you off the couch and ready to finish a 5K. Is there any way to sign up to the Halloween Half and the Full Marathon in a bundle (basically do the spring full bundle without the spring half) or do I have to sign up to them individually?? Thanks! The only bundle is the bundle of 3 consecutive programs. You don’t have to do all 3 but it’s going to save you money even if you do two. You would be registering for the Halloween for just $50 more instead of paying $99 more. Hi, I just signed up for Paris marathon 2018, will be on April 86th next year. It will be my first marathon and I have run only 1 half marathon so far and many other 5k-10k runs. None of the plans listed seem to fit my calendar. do you have any other training plan you might recommend? An April race may be too far off our schedule to fit into our program. I’d come to our free fun runs, Tuesday and Thursday 6:30pm from FootWorks in South Miami. There’s a chance you may find a partner that is training for an April marathon too. Hi Does the Halloween Half Training program have a walker group? Hello Karolyn! Yes it does. I would like to join to the Miami half stating in October. At what time and what days are the trainings? The group runs for the Miami half training that begins in October meets every Saturday for the long run. Starting times vary based on distance, we generally start at 6am. We encourage you to join us for 3-4 mile fun runs from our store, FootWorks in South Miami every Tuesday & Thursday at 6:30pm. Part of the training program is to run three days a week. Please give us a call or stop into the store if you have further questions. I am interested in the the training group for the 2019 Miami Full Marathon. Do you have a sample training schedule that the group will follow? Hello Elger! We don’t have a sample schedule but the training program follows a pattern of 2 to 3 weeks of building distance, then a recovery week where we fall back and run a shorter distance. Hi, what time and where do the saturday morning long walks/runs take place? Hi Silvia, Runs start from the FootWorks Running Store, 5724 Sunset Dr. The start time depends on that days distance and your pace. Our goal is to finish by 7:30am. Therefore if you’re running for 6 miles and you’re in a 10 minute pace group then you’ll start at 6:30am. what ‘pace groups’ do you have – e.g. sub 3 hour marathon? We have about 6 pace groups for the Full starting with 9 minute miles to about 13 minute miles. Is included the registration to the half marathon? Or I should pay separately? Hello Abner. Entry to the race is not included but you will be given a discount code for the Miami Full and Half. My daughter and I and several others are thinking of doing the Half Marathon, 1/27/19. What does the registration fee with you include? Does it pay for the Half Marathon registration? Do you have discounts on your training fee if we sign up as a group? This will be our first Half, so sorry for all the questions. Thank you . Hello Enrique! The fee includes the training. It doesn’t include entry into the race. Please call us 305.666.7223 to discuss joining the training program while it’s already in progress. Hi. How many times a week the team meets for training? Hello Ava! We meet Saturdays for the long run. Then two weekly runs which you can do at FootWorks on Tuesday and Thursday nights at 6:30pm or on your own.